(Photo: REUTERS / Alessandro Bianchi)Pope Francis (L) and Cardinal Tarcisio Bertone step off a plane after returning from their trip to Brazil at Ciampino airport, south of Rome, July 29, 2013. Pope Francis left Brazil on Sunday with Rio still pulsating with excitement after a historic beachfront Mass for more than 3 million people in which he challenged young people to build a new world based on tolerance and love. ROME (Reuters) - Pope Francis, in some of the most compassionate words from any pontiff on gays, said they should not be judged or marginalised and should be integrated into society, but he reaffirmed Church teaching that homosexual acts are a sin. In a broad-ranging 80-minute conversation with journalists on the plane bringing him back from a week-long visit to Brazil, Francis also said the Roman Catholic Church's ban on women priests was definitive, although he would like them to have more leadership roles in administration and pastoral activities. Francis defended gays from discrimination in what was his first news conference since being elected pontiff in March, but also referred to the Catholic Church's universal Catechism, which says that while homosexual orientation is not sinful homosexual acts are. "If a person is gay and seeks God and has good will, who am I to judge him?" the pope said. "The Catechism of the Catholic Church explains this very well. It says they should not be marginalized because of this (orientation) but that they must be integrated into society," he said, speaking in Italian. "The problem is not having this orientation. We must be brothers. The problem is lobbying by this orientation, or lobbies of greedy people, political lobbies, Masonic lobbies, so many lobbies. This is the worse problem," he said. Francis was answering a question about reports of a "gay lobby" in the Vatican. "You see a lot written about the gay lobby. I still have not seen anyone in the Vatican with an identity card saying they are gay," he joked. Addressing the issue of women priests, the pope said, "The Church has spoken and says 'no' ... that door is closed." It was the first time he had spoken in public on the subject. "We cannot limit the role of women in the Church to altar girls or the president of a charity, there must be more ...," he said in answer to a question during a remarkably frank conversation with Vatican journalists. "But with regards to the ordination of women, the Church has spoken and says no. Pope John Paul said so with a formula that was definitive. That door is closed," he said referring to a document by the late pontiff which said the ban was part of the infallible teaching of the Church. The Church teaches that it cannot ordain women because Jesus willingly chose only men as his apostles. Advocates of a female priesthood say he was acting according to the customs of his times. Many in the Church, even those who oppose a female priesthood, say women should be given leadership roles in the Church and the Vatican administration. 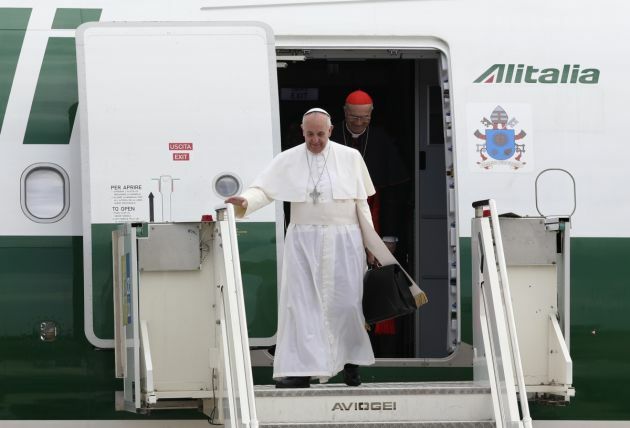 Francis arrived back in Rome on Monday after a triumphant week-long tour of Brazil which climaxed with a huge gathering on Rio de Janeiro's famed Copacabana beach for a world Catholic youth festival which organisers estimated to have attracted more than 3 million people.